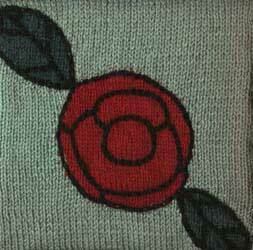 I used approximately 35gm light green 8ply (DK) wool @ 100m (105yd) per 50gm and scraps of red, black, and green for the rose. Cast on 47sts and work following chart, using the intarsia method. Using black, embroider the details in the rose and leaves, using the photo as a guide.